It is outrageous that the fake news media is not outraged that Donald Trump has been left empty handed at this year’s Nobel awards. This oversight must be rectified next year. Obama got a prize after eight months, but not Trump. 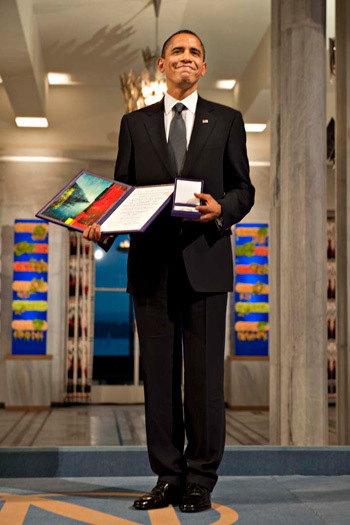 Not only did the Norwegian Nobel Committee pre-emptively award Barack Hussein Obama the Nobel peace prize only eight or so months into his presidency, it has betrayed its liberal bias against Donald Trump. In addition to slapping him in the face, it has undermined his foreign policies by awarding this year’s peace prize to his enemies. I mean the prize was awarded simultaneously with Trump’s announcement of the “calm before the storm” regarding the Iran nuclear deal. How much more blatant can it get? I would not be at all surprised that Donald Trump is fuming right now at this double slight and thinking about where the Nobel Committee and the liberal media can stick that award. Yes, they can – truly so. As a limp-wristed progressive who was opposed to prematurely awarding a peace prize to Obama, whose foreign policy change was cosmetic, I cannot advocate that Trump be awarded the peace prize, as he cooks up conflicts on multiple fronts. However, there is an award which Trump richly deserves, and I would like to take this opportunity to nominate the American president for next year’s Nobel prize in literature. In fact, I believe Trump should have already been awarded this year’s prize. Naturally, as a writer and as a reader, I can see why Kazuo Ishiguro deserves respect and how the Japanese-British novelist has “uncovered the abyss beneath our illusory sense of connection with the world”. Nevertheless, with all due respect, while Ishiguro’s pen uncovers the abyss, Donald Trump actually embodies and embraces it. The US president possesses an innovative ability to surpass fiction and actually live it. The reality TV star’s apparently improbable rise to power is a story whose magical freakism would stretch the credibility of any fiction writer to the limit, yet Trump managed it in real life – whatever that currently means. Moreover, during his time in office, the US president has demonstrated a singular inability to discern fact from fiction, conspiracy theories from actual conspiracies, facts from alternative facts and truth from post-truth. His detachment from reality would be the envy of any lifelong dictator, but Trump has managed this despotic dissonance in a few short months – perhaps his long career as business monarch prepared him for this fantastical feat. More impressively still, Donald Trump has managed to persuade millions of his supporters of a number of elaborate, far-fetched fictions, perhaps the most astounding of which is that a self-centred, self-absorbed, selfish billionaire out to enrich himself through public office is somehow the president of the common man and woman who is draining the swamp, making America great again and putting America first. Awarding Trump the Nobel prize in literature would also continue the creative path beaten by the Swedish Academy last year when it unexpectedly named Bob Dylan its Nobel laureate. If an American rocker can win the Nobel prize in literature, why not an American politician, tycoon and reality TV star? Naturally, Trump is not the sole political candidate for this prestigious award. North Korea’s Kim Jong-un should be considered as a co-laureate. Both face stiff competition from the likes of Syria’s Bashar al-Assad, ISIS’s Abu Bakr al-Baghdadi, Russia’s Vladimir Putin or Turkey’s Recep Erdoğan. I suspect some readers will disagree with my choice of category and will insist that Donald Trump deserves a Nobel in physics, for the quantum leap he has made in transforming reality into simultaneously a truth and a lie, fact and fiction (faction or fict). Despite his denial of science, Trump demonstrates the possible existence of multiple universes, and that we are suspended in the alternate reality where pink elephants fall out of the sky and explode into a candyfloss mushroom cloud. Regardless of those alternative possible nominations, I insist that Trump most deserves the literature prize, and I hope the Swedish Academy will award it to him next year – if we are all still here, of course.